I did a little brainstorming and wrote a short story that I think might be a good basis for a YA novel. Here it is if you'd like to read it. 10:42pm. My phone stopped ringing and the message Mom Missed Call (37) flashed across my lock screen. Why does she keep trying? My phone dinged again. Sophie it is almost 11. Answer your phone! She knew I wasn't going to answer it and that I could not care less about her being mad about it. She had no power over me. I smiled turning back towards my group of friends. There were three of us currently giving our parents heart attacks. We waited for the guard to turn around towards his microwave before we hopped over the fence into the country club. I hit the grass with a thump, the wave of pressure going through my entire body, leaving my head buzzing for a few moments. It smelled like rotting seaweed and murky water, but we kept shopping for our boat. "Would the blue boat to the left or the white one towards the front fulfill your request my ladies?" Jonah asked gesturing like a posh butler. "Why, the blue one of course." I giggled like Audrey Hepburn. 10:58pm. The white leather seat sent chills down my back. I wondered if I would ever be able to afford one of these before I died... probably not. Sophie! If you keep this up you are going to end up just like Liam. Come home. A twinge of pain followed. I couldn't resist answering, How dare you? I shoved my phone back into my pocket. "Honestly, Soph, you should just chuck your phone overboard. It's not like it would change anything." Rose started unpacking her bag as Jonah found the boat's handbook. "How to Hotwire a Boat, by the Boatbuilder's Organization," I said sarcastically. Jonah glared at me. 11:13pm. The salty wind blew in my hair as Jonah drove away from the siren-filled dock. Rose cheered and flipped off the distraught guard. My phone continued buzzing in my back pocket, but these were the memories I would keep forever -- the stories I would tell my kids. Unlike my mother, I was living life. 11:19pm. The sea rocked us back and forth as we stared at the stars, no lights in sight. The Bud Light went down my throat, leaving a bitter taste in my mouth and warming up my stomach. I crunched the can between my hands, threw it overboard, and started guzzling down another one as Rose rambled, "My mouth is sweating." She blew a puff of smoke into my face. I fanned it away - it smelled like skunk and I did not want another headache. The waves started feeling rockier as my mind spun out of control. I stood up, stumbling, catching myself on the damp silver railing. Jonah was behind the steering wheel and wrapping my arm around him. I turned up the radio's volume knob: "This is 102.7 Kiss FM and we're playing another full hour of commercial-free hits!" 12:20am. My phone hadn't vibrated in a while so I pulled it out of my pocket. Something is wrong. Bringing your father to the hosp. "Get off your phone!" Rose lunged towards me and snatched it out of my hands. She began walking near the edge of the boat, like an acrobat balancing on a tightrope. "Stop!" My heart was beating at a thousand miles per hour: I felt sobered up. Rushing to her, my body felt lazy and heavy. I rocked as I tried to get closer to her. Rose held my phone out over the side of the boat. I reach for it. I plunge. 12:11am. I splash my arms back and forth trying to get closer to the surface of the water, but my body doesn't cooperate. Seawater passes through my nose, burning my lungs and making me nauseated. I come up for a few seconds and take the deepest breath possible. "Sophie! Sophie!" I see Rose screaming as Jonah runs up behind her. My heart pounds in my chest as I think all my thoughts at once, in firework flashes. I begin to sink, watching the light of the moon get smaller and smaller. I continue to thrash my arms, refusing to give up, until everything goes black. ​12:15am. My eyes shoot open. Everything around me is dark. Shadows dance around me as I stand surrounded by a humming noise. "Hello?" I call out. I begin walking aimlessly. My body feels heavy and the feeling of someone sitting on my chest overwhelms me. "What is this place?" I shriek this time. "What is happening to me?" I'm starting to lose my breath. Behind me, the hum becomes louder. My head pounds in return. I try to whip my body around, but it is sluggish and slow. "Who's there?" A shadow grows bigger, approaching me with no intention of stopping. I shut my eyes, unable to move, preparing to be hit. Then, nothing happens; the shadow simply glides through me. The pressure increases on my chest. Where am I? 12:16am. I have been following a shadow for what feels like an eternity. The hum continues and the suffocating sensation grows. As I place one foot in front of the other, the flat ground slopes downward. The temperature cools, but it burns my body. It feels as though dry ice is being help up against every inch of my body, making my skin melt and my bones freeze. 12:18am. As the floor flattens again, the sensations hitting my body are unbearable. I try to let out a scream, but with weight on my lungs, short breaths are the most I can handle. Looking over the shadows in front of me, all I can see is a dead end. 12:19am. The shadows have disappeared and one again, I find myself alone. I stretch my arms out to my sides, trying to find a wall to guide me. Nothing. I stick my arms in front of me, reaching forward. I feel knives slice my hands as I touch the wall. I pull away. The humming gets louder, the smothering increases, and the freezing burning becomes intolerable. I throw my body onto the placard ahead of me and it turns, revealing a clearing. 12:20am. I cross the opening and collapse. Everything has stopped except for the soreness in my lungs. I begin to weep, exhausted and afraid. "Sophie?" I raise my head, too tired to pull my body up. "Sophie? What are you doing here?" My brother comes to me and cradles my body. "Liam?" I whisper, startled. "What? Where? How?" He shushes me. Last time I saw him, bits of machine were sprinkled on the road, my mother was wailing, and a white sheet covered his drug-infested body. "Am I dead?" My voice cracks when I look up at him. He shakes his head. I examine his face. He looks healthier and definitely stronger. Most shocking, though, is that his forehead isn't creased with anger and his eyes aren't filled with hate. He looks peaceful and calm. I sit up so that I am face-to-face with him. "What is happening?" 12:22am. Every few seconds I feel a push on my chest. Liam starts to explain that I am in limbo, and the road to Hell is ahead. "All that pain you experienced is nothing compared to what happens down there. Your worst fears haunt you and you relive your mistakes daily." I am still in shock. "Then why do you look so calm?" I ask. "You learn to fix yours wrongs, and forgive. You help people." I nod. I have always looked up to him as my hero, and I can't believe this was where he has ended up. "Sophie, what is wrong with you? Didn't you learn from me? You are dying. Mom--" I scoff. "Oh come on!" I try to stand, but gravity has multiplied and I am stuck. "You can't leave until you die or come back to life, so answer my questions." Liam's tone has completely changed. I explain everything to him, how Mom has become cold and distant since he died and how my mind is always chaos. He looks hurt. "I understand what you're saying, but it doesn't give you an excuse to act this way. Breaking the rules, breaking the law, walking all over people who are there for you -- throwing away your future. You're better than this." The entirety of what Liam says is true, but changing isn't an option. 12:24am. I am pretty sure I am going to die at this point. Liam and I have been talking for hours. I have broken down as the rhythmic pushes on my chest continue. "You have to change. This is your last chance," Liam begs. "How?" It is such a simple question, yet I can't seem to answer it for myself. "How am I supposed to change? I love my friends, my experiences.... all of it." He looks at me warmly. "Sophie, you can keep your friends, you just have to adjust your attitude. You cannot run around all night worrying Mom and Dad. It isn't fair to them. Don't you remember what happened to them with me? It broke them." I nodded, picturing Mom staying in bed, not eating, for days after the accident. Dad going on drives for hours, only to come back with bloodied knuckles, probably from hitting a wall or the steering wheel. Throughout the past few years, I haven't realized that history might be replaying for them. I smile at Liam, he hugs me, and the pressure on my lungs vanishes. 12:25am. "Sophie! Sophie!" Rose shrieked towards the sky. As I coughed, my throat burned from the salt water. I tried opening my eyes, but I was too weak and my body ached as I was lifted into a sitting position. "Oh my God." Rose wrapped her arms around me while someone else, Jonah I suspected, poured water into my mouth. It felt refreshing, coating my throat with cold. Through my eyelids, I saw flashing lights. I heard someone yelling, "Everything is going to be okay, Sophie." Rose didn't let me go; I could feel her wet cheek against my forehead. My eyes still closed and my body drained, I began losing consciousness. 6:23am. The beeping of the machines surrounds me and I feel tangled in the numerous wires attached to me. I flutter my eyes open and someone squeezes my left hand. At first everything is blurry, but soon enough my vision clears and I see an empty room. "Mom?" I gasp. The grip on my left hand tightens. She shushes me and tells me to rest. I turn to her and she managed to smile. "Dad?" I pause for a second. "He's okay. Just kidney stones, nothing lethal." I nod, thankful. "Mom, I am so sorry." My voice cracks. "For everything." Her expression warms. "I love you," I say. "I love you too," she says. Then I feel myself drift off again. 10:04am. I wake to the door opening and a waft of perfume entering the room. "Hey Soph, How are you feeling?" I nod, but see that my mom is gone and get nervous. "She just ran home to take a shower and grab some clothes." Rose smiles, a tear streaming down her face. "Don't cry," I manage to gasp. "You died, Soph. Your heart..." She covers her mouth, trying to control her emotions. "Your heart stopped beating. I thought you were gone." I look down at my IV. "I saw Liam." I whisper in a rasp. She shifts her weight on the bed. "He's changed so much. I think he'll finally get to go to Heaven." This year has been a busy one for me. From finally finishing writing the book that I wanted to read, and then going down the route of self publishing, to moving to a new state and a new school (just like Celia, the main character in Heartshire High), there has always been something new happening. I could have taken the summer off and relaxed. I could have ignored all the things I needed to do and binge watch Game of Thrones instead. I'll admit, I did some of that. But I've also been working toward my goals. At the start of the year I set myself goals. Ambitious, but achievable ones (and one obnoxious one - I read that having one giant dream not only makes you work harder, but also makes the other ones easier to achieve) and steadily, after a lot of hard work, I am crossing my goals off. I won't share all my goals with you here, but I will share a few that I've accomplished already. And since I know you will ask about my obnoxious one, I'll share that with you too (and ask the universe for help while i'm at it)! Even though I still have a few months left in the year, it's pretty clear to me that this one won't come true - after all, I don't have another novel completed yet! But getting to #3 on the Amazon list of ebooks in Teen and YA Being a Teen Fiction was a pretty cool stepping stone! Last week I held my first giveaway for Heartshire High (via Goodreads). I was hoping at least 5 people would request free copies (otherwise that would have been embarrassing), but amazingly 591 people entered!!! ​Thanks everyone for entering and well done to the 5 lucky winners.....your books will be in the post next week! A few days ago I gave a copy of Heartshire High to Rebecca, one of the reviewers at Aussie Owned and Read. Since she is based in Australia I sent her an e-version of Heartshire High (shipping a copy would probably take months), and within two days she wrote back saying she likes the book already, but then posed the disaster question: "Are the mentions of lyrics actual lyrics of real songs?" Why, yes they are.... I was thinking how clever it was to include lyrics and if I ever had an audio book made, I would get the music to play along side the words. "Just need to be careful that they are in public domain and you have permission to quote them in this book". WHAT?! This is one reason self-publishing is harder - I am solely responsible for the book, there aren't editors, proofreaders, a marketing team or a publisher telling me what to do, or doing the work for me; Heartshire High is my baby and so I need to pay extra attention to potential issues that arise with it. Long story short, I am forever grateful to Rebecca for checking with me that I knew about this. I did not and she may have saved me from a lawsuit for copyright infringement. It seems a ridiculous law but this has been an important point in my self-publishing journey. I need to keep reading, keep learning and keep connecting with readers and other young writers. Rebecca and the other writers, reviewers and authors in the YA facebook groups have been incredibly supportive of my journey with Heartshire High, and they are always sharing tips and ideas with each other. To come into contact with this amazing online community of writers and YA readers is the reason I gave up on the traditional route and chose self-publishing. Connecting with a community and with my readers directly is an understated but important aspect of writing, and will definitely contribute to making me a better writer in the long run. I am now in the process of uploading the updated manuscript to the publishing platforms and instead of doing it with a frown, I am smiling because I am grateful for all the help I have received from the YA reading community! Want a free copy of Heartshire High? Enter now! Giveaway ends September 05, 2017. It's been an amazing week! Heartshire High has debuted at #3 on Amazon.com's Teen and YA Being a Teen Fiction ebook Releases. This is within the first week of release - oh the places we can go! If you don't have your copy yet, grab a paperback or e-version over on Amazon. I had the craziest weekend. Crazy in a good way, but crazy none the less.... Ni Hao! Saturday morning I awoke to an interesting email from a Chinese company. I wasn't quite awake and so I thought it was spam, but as I read I realized it was actually the most amazing offer in my book journey so far! A Chinese publishing company offering to translate and publish my book - in CHINESE!???!!! It still sounds surreal even typing this, but apparently Chinese readers really like Alice in Wonderland, and this publisher found my profile and book on Goodreads. Of course no offer is too good to be true, as China has strict control over what their people read, so Heartshire High will first need a project manager and then translating, editing and proofreading before being checked by the media controls, and only then can it appear on bookshelves. The whole process is expected to take over three months so in reality Heartshire High won't reach China until 2018 but still i'm ecstatic! And the publisher said they will do all the work and has emailed me a contract already. Don't worry readers, I already did my research on this publisher and let my dad check the contract with his lawyer and it isn't a scam. They even sent me some potential book covers - they look so amazing! Which one do you like better? Stay tuned for Heartshire High's takeover of the world! And maybe after the last five years of studying Chinese, I'll actually be able to read my own book! When writing Heartshire High, one of my goals was to make sure the book passed the Bechdel test. Increasingly appearing in mainstream conversation, this test requires are that two or more female characters must hold a conversation where the topic of conversation is not men. Seems easy and obvious at first, right? It seems like every work of art would pass it? You might be surprised. The next time you watch a movie , stream a TV show on Netflix, or read a book, take note. When two women are talking to one another and no men are involved in the conversation, what are they talking about? 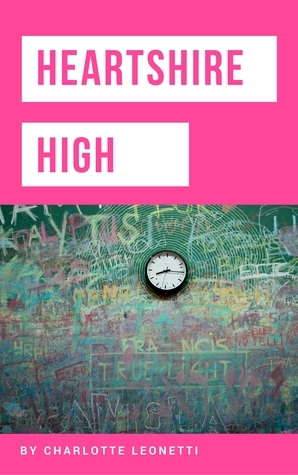 As a teenage girl myself, I felt it important that readers, especially my fellow girls, be able to connect with the characters and see a proper representation of interactions when it comes to life in high school. Completing this test also ended up benefitting the book in ways I had no expected. I was able to expand the dimensions of the different individuals to a greater extent, as there were no restrictions when it came to certain stereotypes commonly used. The characters seemed to come to life on their own as their varied conversations helped expand their personalities. YA novels always have a love story thrown in, and it was such a relief to read one that didn't, even if I had to write it myself. I recommend all authors take the Bechdel test into account when writing as I feel it will impact both the writing process of the story and later the audience in an extremely positive way. And, in case you didn't know, sometimes in real life girls talk about things other than boys. Back in April I wrote a blog post about self-publishing. Well, it wasn't quite a post about me self-publishing, but rather me thinking about it. After all I've sent out dozens of query letters to publishers and most don't even bother to respond. If they do it's with an automatic template of 'thanks' and 'if we like your work (If your writing is good enough or if you are worthy) we'll get back to you'. I'll be honest - I give up. This feeling of waiting, hoping, disappointment everyday when I check my email and nothing is there, this isn't how I want to proceed in my writing life. I know Heartshire High is good enough, I know that teens will love it and it will resonate with them, and I don't want to wait for someone else to decide on if it gets published or not. I am taking matters into my own hands: I'm going to self-publish! Maybe it won't make the NY Times bestseller week, or be distributed to every bookstore in the States (or worldwide), but these days even publishers can't promise that. What I really want is feedback, communication, dialogue with the readers and to hear their thoughts. As a fan of Alice in Wonderland, I want to connect with like-minded readers who understand the subtle references to the original in the book. I'm not so focused on sales or making money, rather getting the book to people who want to read it. Therefore, after extensive reading around the subject (and a big thanks to Joanna Penn who has scores of self-publishing information on her website), I will publish Heartshire High independently. Amazon, Smashwords, Kobo and even Barnes and Noble all support indie publishers and authors, and the more I'm digging, the more interesting information I am finding. Also there are lots of groups to support and help self-publishing authors, and even though I've only reached out to one facebook group - the alliance of YA authors - the people there have been so friendly, welcoming and open with information, that they are giving me the confidence to publish! So stay tuned and keep your eyes peeled for Heartshrie High with a bright pink cover! Bookshops, kindles and kobos.... I'm coming soon!